Bell’s palsy is an idiopathic facial paresis of lower motor neuron type that has been attributed to an inflammatory reaction involving the facial nerve near the stylomastoid foramen or in the bony facial canal. A relationship of Bell’s palsy to reactivation of herpes simplex virus has recently been suggested, but there is little evidence to support this. The clinical features of Bell’s palsy are characteristic. The facial paresis generally comes on abruptly, but it may worsen over the following day or so. Pain about the ear precedes or accompanies the weakness in many cases but usually lasts for only a few days. The face itself feels stiff and pulled to one side. There may be ipsilateral restriction of eye closure and difficulty with eating and fine facial movements. A disturbance of taste is common, owing to involvement of chorda tympani fibers, and hyperacusis due to involvement of fibers to the stapedius occurs occasionally. The management of Bell’s palsy is controversial. Approximately 60% of cases recover completely without treatment, presumably because the lesion is so mild that it leads merely to conduction block. Considerable improvement occurs in most other cases, and only about 10% of all patients are seriously dissatisfied with the final outcome because of permanent disfigurement or other long-term sequelae. Treatment is unnecessary in most cases but is indicated for patients in whom an unsatisfactory outcome can be predicted. The best clinical guide to progress is the severity of the palsy during the first few days after presentation. Patients with clinically complete palsy when first seen are less likely to make a full recovery than those with an incomplete one. A poor prognosis for recovery is also associated with advanced age, hyperacusis, and severe initial pain. Electromyography and nerve excitability or conduction studies provide a guide to prognosis but not early enough to aid in the selection of patients for treatment. The only medical treatment that may influence the outcome is administration of corticosteroids, but studies supporting this concept have been criticized. Many physicians nevertheless routinely prescribe corticosteroids for patients with Bell’s palsy seen within 5 days of onset. The author prescribes them only when the palsy is clinically complete or there is severe pain. Treatment with prednisone, 60 or 80 mg daily in divided doses for 4 or 5 days, followed by tapering of the dose over the next 7–10 days, is a satisfactory regimen. It is helpful to protect the eye with lubricating drops (or lubricating ointment at night) and a patch if eye closure is not possible. There is no evidence that surgical procedures to decompress the facial nerve are of benefit. An individual nerve may be injured along its course or may be compressed, angulated, or stretched by neighboring anatomic structures, especially at a point where it passes through a narrow space (entrapment neuropathy). The relative contributions of mechanical factors and ischemia to the local damage are not clear. 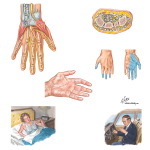 With involvement of a sensory or mixed nerve, pain is commonly felt distal to the lesion. Symptoms never develop with some entrapment neuropathies, resolve rapidly and spontaneously in others, and become progressively more disabling and distressing in yet other cases. The precise neurologic deficit depends on the nerve involved. Percussion of the nerve at the site of the lesion may lead to paresthesias in its distal distribution. Entrapment neuropathy may be the sole manifestation of subclinical polyneuropathy, and this must be borne in mind and excluded by nerve conduction studies. Such studies are also indispensable for the accurate localization of the focal lesion. A. Diabetes Mellitus: In this disorder, involvement of the peripheral nervous system may lead to symmetric sensory or mixed polyneuropathy, asymmetric motor neuropathy (diabetic amyotrophy), thoracoabdominal radiculopathy, utonomic neuropathy, or isolated lesions of individual nerves. These may occur singly or in any combination. Sensory polyneuropathy, the most common manifestation, may lead to no more than depressed tendon reflexes and impaired appreciation of vibration in the legs. When symptomatic, there may be pain, paresthesias, or numbness in the legs, but in severe cases distal sensory loss occurs in all limbs. Diabetic amyotrophy is characterized by asymmetric weakness and wasting involving predominantly the proximal muscles of the legs, accompanied by local pain. Online Canada Drugs Thoracoabdominal radiculopathy leads to pain over the trunk. In patients with autonomic neuropathy, postural hypotension, impaired thermoregulatory sweating, postgustatory hyperhidrosis, constipation, flatulence, diarrhea, impotence, urinary retention, and incontinence may occur, and there may be abnormal pupillary responses. Isolated lesions of individual peripheral nerves are common and in the limbs tend to occur at sites of compression or entrapment. Treatment is symptomatic. Entrapment neuropathies may be helped by surgical decompression. Treatment of neuropathic pain is discussed above.